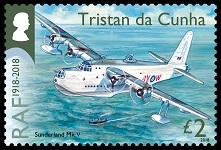 Set of stamps issued by Tristan, including the legendary Short Sunderland! Interesting. Like the choice of subjects. Magic stuff, I love the connection with RAF Calshot. My brother and I were at an RAF kids camp there for a week in the 50s, maybe '57, and spent much of our time aboard various ASR boats based at Calshot Spit. That only just pre-dated the Tristan's time at the base.